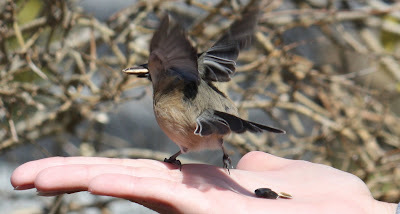 Training this little bird to take seeds from our hand was not an easy task. It took time and lots of patience, and as you can see, our perseverance paid off. This little bird continues to visit our home and perch on our outside hedging. We keep sunflower seeds just inside our door and as soon as we step outside, he immediately flies towards our hand, takes the seed and is gone in an instant. Can you imagine just how much courage this little bird must have to fly into a stranger's hand to receive food? Cancer patients have great courage to face their treatments, side effects, testing and reports - it is truly amazing! I'm sure finding that courage does not come easy for anyone, but it is to be applauded and admired. Living with cancer takes courage, fighting it takes patience and perseverance. Now, when you look closely at the picture below, you can see the sunflower seed clearly in his beak as he spreads his wings to fly. His courage and bravery have rewarded him!!! When you are scared and uncertain about going that extra distance, stay brave and courageous! Very sweet ... good post.